Most States require that the puppy be at least eight (8) weeks’ old (View All 50 State Laws). When Do I Need a Dog/Puppy Bill of Sale? Why Is a Dog/Puppy Bill of Sale Necessary? 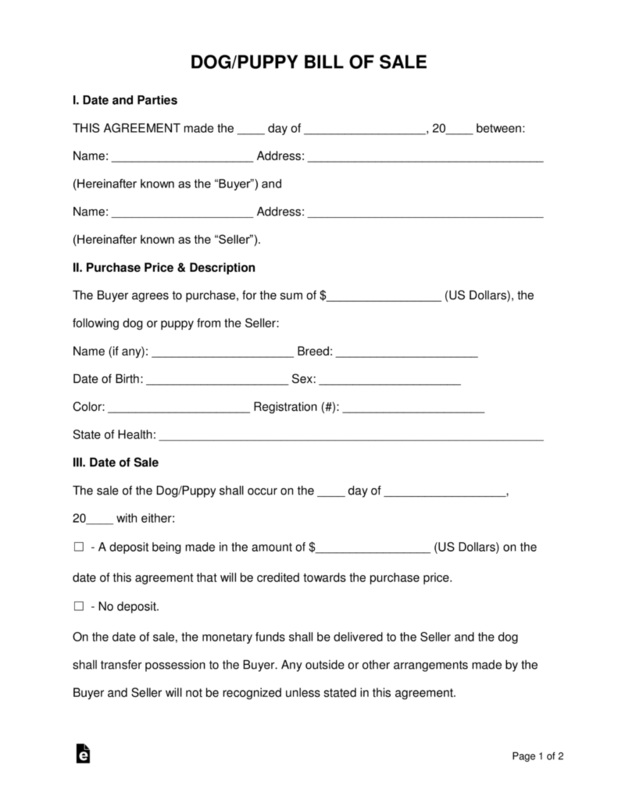 The Dog/Puppy Bill of Sale is a legal document that states the terms and conditions for the sale or transfer of ownership of a dog. 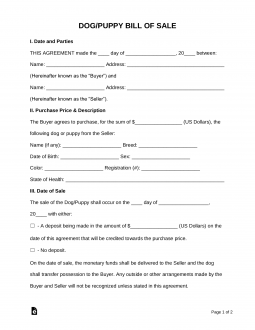 Essentially, this document is crucial in proving that a sale was made and that there is a new dog owner. So now that you know why you need a Dog/Puppy Bill of Sale, how do you go about selling your dog? Below is a simple step-by-step guide for you to follow to ensure your four-legged friend finds a great home. To have the best chance of finding homes for your pet(s) quickly, start advertising as early as possible, especially if you know you’re going to have puppies on the way. Gather all the important information about your dog or puppy’s breed, vaccinations, and other important information required on our form. Then hang up flyers in busy public places, put an ad in the paper, and/or put posts online for everyone to see. Make sure to research your dog’s breed so you can make a good price to sell for. More than anything, you want to make sure your dog is finding a caring and loving home. Ask the buyer about past ownership, why they want to buy your dog, a bit about their neighborhood, and how they plan to take care of the dog. Once signatures are made, go to your public notary to receive a Certificate of Acknowledgement. This will complete the form and finalize the sale.